If it wasn't already clear, everyone should know by now that bees are pretty much the most crucial creature on the planet. They're basically responsible for ensuring that life keeps moving forward thanks to all their pollinating goodness. Sure, the honey bee does so in droves, making a ton of honey to survive over the winter. But, even the slightly awkward and totes adorable bumble bee makes their fair share. And, with their awkwardness, well, they probably are doing even more of the pollination work! When your little one prances out in this Deluxe Bumble Bee Costume, we can feel secure that the whole world will finally sit back and "get it." Our team of beekeeper specialists have taken time away from the hives to consult with our designers and this exclusive look is your honey-like prize. The dress is black and yellow with a fluffy fur collar at the neck and a tiny stinger in the back. The antennae headband is covered in fuzzy fabric. The armbands match both the fur and jersey color scheme while the iridescent wings attach to the dress to finish off this friggen adorable look. SAVE THE BEES; SAVE THE WORLD! Remind the world just how cute everything can be when your little darling becomes your bumbling babe. 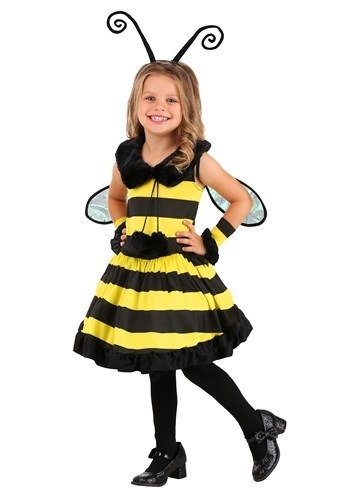 This Bumble Bee Costume is the perfect way to let your kiddo take flight and spread some flowery joy!